What was it specifically about Clevelander Chassidus, that caused you to become a Clevelander chassid? I was looking for a Chassidus that concentrated on emotional prayer yet I wanted it to be something small on a less grand scale than something like Ger, Belz, Vizhnitz or Satmar where I would be lost in the crowd. 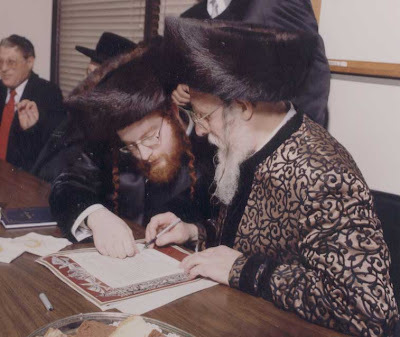 I wanted a personal connection to the Rebbe and was looking for as close to a one on one relationship as I could find. I met my Rebbe in Ra'anana and instantly found that we had much in common, we both traced ancestry to Chernovitz, he spoke English as well as Hebrew and Yiddish, the nusach and customs were already quite similar to what I had been doing with a few slight changes and he had the fiery style of avoda I was looking for, plus I quickly noticed that the Chassidus was a smaller one and that I could try to build that kesher of personal contact I was looking for. When I heard the Rebbe's powerful Kiddush in the fiery Nodvarna Nusach I was sure of it and thats when I knew I had me my Rebbe, I have been a Nadvorna / Clevelander Chasid ever since. That was over 10 years ago. whoda thunk there'd be Rebbes named after American cities! more rebbes, the better, I say. Nice post. Rabbi Zwecker is very thoughtful and very honest. Do you think Pittsburgher, Clevelander, and Bostoner are any more grotesque than Tchernobler, Satmarer, or Munkatcher? The Rebbes bring great kavod to the cities fortunate enough to be named for their courts! In our brilliant and illustrious Jewish history, think of how the towns of Kovno, Vilno, Berditchev, Pumbeditha, Carpentras, and so on and so forth, resonate with the glory of the Torah that was learned and expounded in locations that otherwise would be rather barren of more than local interest. Even were European culture and its American extension to disappear, the names of these cities would not be forgotten in the annals of the eternal people.